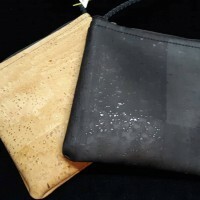 These cork bags are perfect for shopping outings or a night on the town. Large enough to have all the essentials with you and small enough to not be a bother. Each measures 5.5" wide and 5.5" long. Wipes clean and has a black corded shoulder strap. Vegan friendly too!